Mix the olive oil, coconut oil, and SheaMoisture Raw Shea Butter Restorative Conditioner together in a bowl. Saturate your hair with your conditioner mix and cover with a plastic cap for 45 min and then rinse. Apply the SheaMoisture Coconut and Hibiscus Curling Gel Souffleand Cantu Leave In Conditioning Repair Cream all throughout your hair. Separate the front section of your hair from the rest using clips to hold the hair in place. Add more Cantu Leave In Conditioning Repair Cream to your ends to ensure definition and begin to flat twist from the crown to the edges. Your hair should look like cornrows. The smaller the sections, the tighter the definition. Twist the short side and back sections if the hair is not long enough to flat twist. Air dry as much as possible before bed or sit under a hooded dryer, secure with a satin scarf, and release in the morning with a little oil on your hands to prevent frizz. YouTube, Instagram, and AfricanExport Blog. 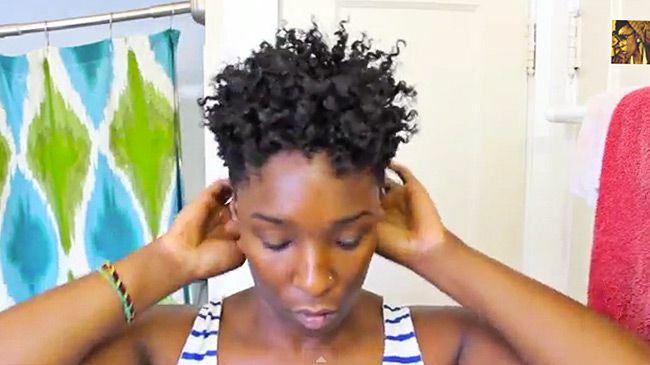 How do you achieve supreme definition with your TWA? How do you maintain it for second, third, and fourth day hair?